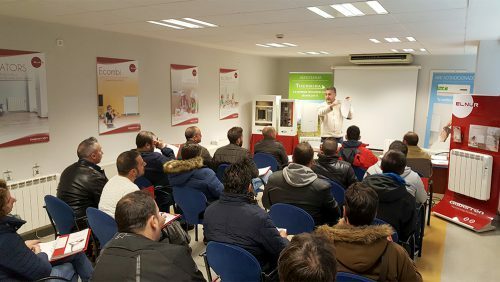 With facilities of more than 20,000m2 in Madrid, Spain, 40 years of experience in heating, a full range of products in constant evolution, and with an extensive human and technical team, ELNUR provides you with the most efficient heating solution demanded by you, in a constant ever-changing world. Our commitment to quality is unwavering, and that is why we have control of the processes in all areas of the company. The company certifications of the management systems according to the standards ISO 9001 and ISO 14001, as well as numerous international product certifications, guarantee our rigorous and professional control of the processes through a cycle of continuous improvement in all areas, with the objective of achieving the greater customer satisfaction. The fully automated electrostatic powder coating station, guarantees a perfect finish of our products, fully resistant to aging and corrosion. Five assembly lines assure a year-round service of more than 150,000 inertia heaters, 40,000 storage heaters and 30,000 convectors, panel heaters and other electric heating devices. Not only every manufacturing process is tested and approved, but also every single unit is fully verified before packaging. Our product tracking system is the differentiation key. We perform several tests on our devices continuously to analyze yields and study improvement options, achieving maximum efficiency and minimizing running costs. We demand the highest quality in the components used and we carry out continuous evaluations to our suppliers. Our objective maximum is the satisfaction of the client, and we are able to meet the requirements all time with the most demanding expectations. Another foundation is the proximity to our customers. Our work in training and customer qualification, as well as ELNUR after-sale service is essential to maintain this high product and service standard in the market. From here, ELNUR has developed a distribution network that currently reaches more than 15 countries worldwide. However this is just the beginning, we still have a lot of work ahead since we are determined to reach you and offer you the best heating solution for you and your family.